Are Seed Geraniums Cold Hardy? Seed geraniums (Pelargonium x hortorum) are widely grown due to their prolific flowering and ease of maintenance. If you have ever forgotten to deadhead a spent geranium flower, you will notice the seed pods are long and resemble a beak. Pelargos is the Latin word for "stork." Even the common name, geranium, comes from the Greek word geranos, meaning "crane". Zonal geraniums have a zone of red pigment on the leaves. Both seed and zonal geraniums have the same Latin name, but distinct differences exist between the two. The primary difference is the way that they are propagated. Zonal geraniums are grown from cuttings, and seed geraniums are grown from seed. Zonal geraniums get their name from the strip, or zone, of color along the leaf due to the pigment anthocyanin. Seed geraniums often have denser foliage, and the flowers are single but fuller. Hardy geranium comes from the genus Geranium and is a perennial. Seed geraniums are treated as annuals in all but tropical regions of the world. Annuals are plants that complete their life cycle in one year, but geraniums can last for many years. Temperatures below 32 degrees Fahrenheit can damage geraniums, and you must therefore protect them from hard freezes. Pelargonium x hortorum must not be confused with species of hardy geranium, which belongs to the genus Geranium. Hardy geraniums, also known as bloody cranesbill, are considered perennials and come back year after year. They have different flowering patterns and leaf shapes than seed geraniums. Seed geraniums can grow anywhere in the world where there is adequate light and temperature. Plant seed geraniums outside after all danger of frost has passed. Geraniums need at least six to eight hours of sun a day to flower well. Geraniums grown in shade often flower less, have leggy growth and are more susceptible to disease. 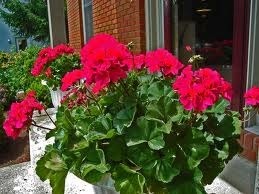 Geraniums are heavy feeders and will exhibit yellowing leaves and dead foliage if nitrogen is lacking. Fertilize seed geraniums every four to six weeks with a 5-10-5 or equivalent fertilizer. You can keep geraniums from year to year. You can overwinter your geraniums inside and keep them year after year, and you have a few ways to accomplish this. Many gardeners take cuttings from their plants in the fall, and root them over the winter indoors. You can dig up and repot large geranium plants into large containers and keep in a cool, bright room during the winter. Don’t worry if your geranium does not flower much during this time. Another way to preserve your geraniums from year to year is to dig up your plants, shake off all the excess soil and hang them upside down in a cool, moist basement with at least 80 percent humidity and temperatures between 35 and 45 degrees Fahrenheit. You will occasionally need to take them down and water the roots during the winter. « What Are the Spikes Sticking Out of My Geraniums?